Chennai is one of the biggest cultural and economic centers in South India and deciding on whether to buy property in Chennai or not is one of the biggest investment decisions most persons get to make in their lifetime. In coming to this decision, most persons are stuck on whether to continue with the flexibility which comes with renting property in Chennai, or make that big decision and buy a home. 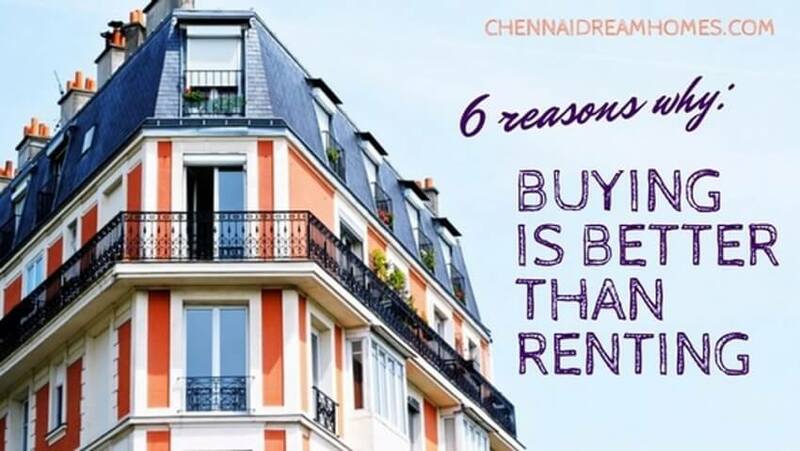 The truth is, deciding to buy property in Chennai is one of the best decisions you could ever make as the long-term savings on investment, tax benefits, and the comfort are just a few of several reasons why buying a home is a great decision. The value of real estate in Chennai and in most other parts of the world increases overtime, because land gets scarcer, so this means when you buy property in Chennai today, its value is likely to be worth a lot more in the future, than it was when you purchased it. Real estate is a safe investment as unlike other investments, it has little or no depreciation in value, and when there’s an increase in the value of real estate in the market generally, yours increases too. When you rent property in Chennai, your monthly rental payments give you a place to stay and more. However, on a property you bought, you gain equity yearly as it increases in value and in India, the value of properties increases on average by 4-6% every year. Keep in mind that real estate is a cyclical business. The difference in your loan payment and the yearly increase in the value of the property is the equity you gain. Owning a home in Chennai means you get to enjoy a reduction in tax every year. This occurs because the interest on your home loan and property tax is deducted from your gross income thereby reducing the amount of your income which gets taxed. Therefore, from these tax deductions, the government is indirectly subsidizing your purchase when you buy property in Chennai. This makes it much cheaper in the long run than getting to pay for rent. When you rent property in Chennai, there’s always the risk that you might be requested to vacate the property at any time, and the process of having to renew the lease on a rental agreement is hard work. But when you buy property in Chennai, you are secure as you can live on your property without any interference or looming risk of evacuation. Buying a home in Chennai is a great asset, and it can always be resold anytime you are in dire need of money, but by renting property, you have no such option. You forfeit the rent you paid for living there, and only get back the security deposit subject to certain terms. When you are on your property, you naturally feel more comfortable and develop a sense of attachment to the community around you, especially if you live in a nice, gated community of villas and apartments in Chennai. It provides a base to care for your locality, neighborhood, and community. This form of emotional attachment is often missing when renting a property in Chennai. If you are convinced that buying is better, contact us today. We’ll be happy to help!